The drive from Burlington south along Routes 7 and 22A gives a visual clue as to Vermont's newest Localvore trend. Viticulture and viniculture has become one of the fastest growing agricultural segments in Vermont's continuing local food product markets. Wine vineyards are being established throughout Vermont as winter hardy grape varieties have changed the way we think of Vermont produced wine. Vermont has always had a small wine industry focusing on apple, pear and blueberry wines. However, due to research and development at Midwestern universities, grape varieties have been developed that can withstand Vermonts harsh winter conditions. Marquette, St Croix and Frontenac are just a few of the varities that have found a welcome home with Vermont vintners. An excellent new book on the subject is "An Unlikely Vineyard" by Deirdre Heekin 2014 published by Chelsea Green Publishing. Deirdre along with her husband Caleb Barber have owned and operated one of Vermont's premier restaurants in Woodstock, Osteria Pane e Salute, for many years. Having grown many of the herbs and produce used in the restaurant on their farm in Barnard, it was a logical progression to develop a vineyard. "An Unlikely Vineyard" is beautifully written and illustrated and fully captures the spirit of connecting with our earth and it's bounty. Their website, www.lagaragista.com, is well worth perusing. 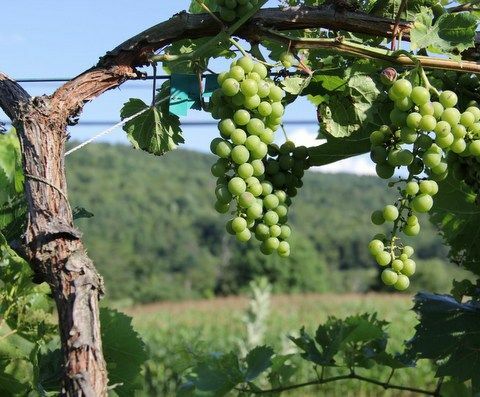 There are many resources to learn more about Vermont's wines and vineyards, including the Vermont Grape and Wine Council and VermontWine.com. And for those really wanting to learn more there is the Vermont Wine School. Whatever the interest level is, the vineyards with their carefully trellised vines add another beautiful element to the Vermont landscape. Vermont’s position as one of the country’s strongest localvore/foodie states is constantly being reinforced by the accolades of international organizations. Just this week Jasper Hill Farm in Greensboro won top honors for it’s Bayley Hazen Blue at the World Cheese Awards in London. And they weren’t alone, two Grafton Village Cheeses won super gold and Vermont Creamery won eight medals. Clearly the artisan cheese producers of Vermont are setting international standards of excellence. Perhaps the fastest rising food related industries in Vermont is the hard cider industry. Ten years ago there was one producer of hard cider in Vermont, today there are fifteen. 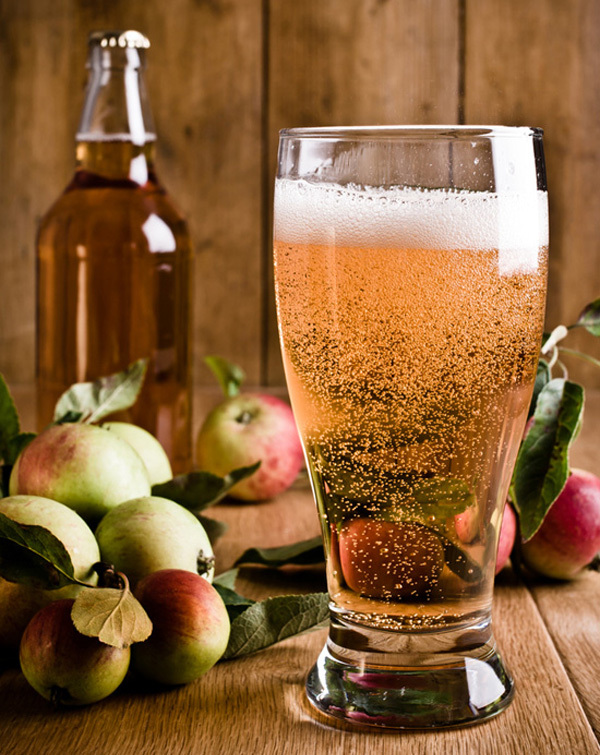 The demand for hard cider produced in Vermont is very strong and growing by the day. This week is being promoted as Cider Week Vermont. A week long celebration of cider tastings, cider mill tours and food and music at many of the stops statewide. Check out the complete calendar of events at the website vermontciderweek.com . I have been visiting orchards and tasting hard ciders throughout my travels around the state this fall and I’m struck by the sophistication of the hard cider offerings. In addition to a selection of wine at Thanksgiving next week. I will have at least 2 or 3 hard cider choices. Something new for us but I’m sure we won’t be alone. The Vermont Barn is one of the most readily identified manmade objects on the Vermont landscape. 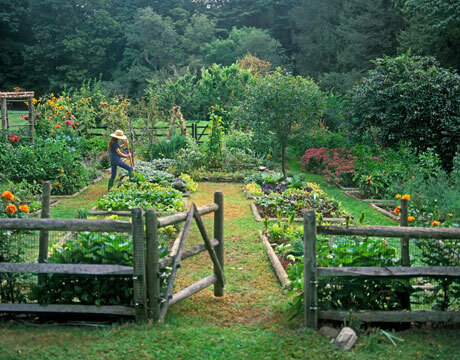 It is symbolic and representative of Vermonts heritage as an agricultural based economy. For the earliest settlers in Vermont, the barn was the most important structure to be built. In most cases, the first generation barn far eclipsed the residential structure in terms of quality. Indeed, it was necessary for the storage of feed for the animals as well as their housing. As agricultural practices changed, so changed the needs and designs of the barns. Alternative practices led to such designs as the round barn. All the while, the Vermont barn served as the anchor for all that took place on the farm. Over the last 200 years, the uses of the barns have ranged from continuance of agricultural practices, to equestrian gentleman farm needs to a general catch all for the owner. 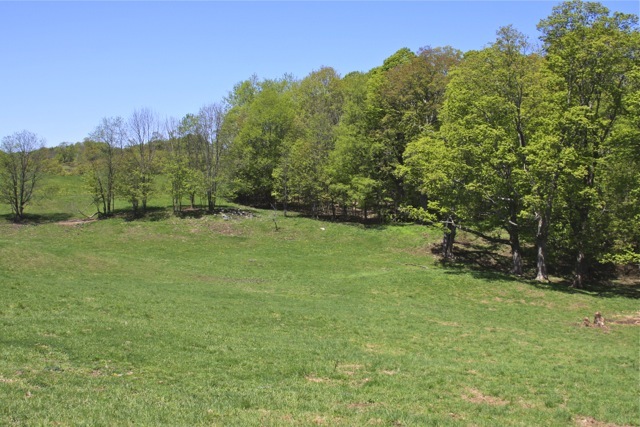 The state of Vermont has fully recognized the importance of preserving the natural landscape and has also understood the necessity of preserving the barn as a symbol of our heritage. All people coming to visit as well as those of us living here have come to expect the barn as a vital element of our pristine landscape. As such, in 1992, the state of Vermont through the Agency of Commerce and Community Development established the Barn Grant. This program is responsible for the preservation and maintenance of hundeds of barns throughout the state. Assuring the future of our favorite icon. As spring is roaring into place, I am remembering all of those projects that were put on hold with winters arrival. Many of those projects are outdoors and involve bettering our immediate environment. Since purchasing our 10 acre homestead, we have removed the overgrown Christmas trees that were abandoned years ago and rejuvenated the fields. We have cleared roughly an acre of poplar, ash and beech that had taken over the front field. The tree lines have been thinned and the branches elevated. And the work continues. A term that has entered our lexicon in recent times is Land Enhancement. I'm not sure if he coined the phrase, but a good friend, Will Russell used the term to describe his company Chippers. Chippers has grown to be regional company with it's focus on Land Enhancement. Land Enhancement might best be described as actions which improve the health and aesthetic of any given land component. This can include pruning, selective cutting of trees and shrubs, fertilizing, mowing and perhaps reshaping the contours. There are many companies such as Chippers that specialize in this work. Short of hiring a company to assess your properties needs, educating oneself of what is possible is prudent and great fun. 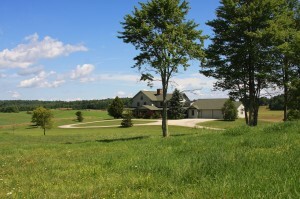 New owners of Vermont properties that have acreage have a unique opportunity to learn and engage in it's maintenance and it's proper stewardship. One of the best starting points would be to get familiar with Northern Woodlands magazine. Both the print version and their website is a huge resource for getting familiar with your land. I would also recommend a publication they produced titled, "The Place You Call Home: A Guide to Caring for Your Land in Vermont". This may be purchased in print or viewed as a pdf file on their website. The title pretty well sums up the excellent content. However, you engage in Land Enhancement, the rewards are most beneficial for the land, your enjoyment of your property and in no small part the value. Stewardship at it's best. Every once and awhile a property will come on the market that embodies most all of the criteria that buyers of #Vermont real estate ask for. The list can be long and varied but inevitably it includes such criteria as acreage, views, privacy, convenient location, quiet setting, active local community, a quintessential general store, close by cultural activities, nearby hospital, multiple recreational activities within a short distance AND a newer vernacular residence that integrates into the landscape with a feel like its always been there. A tall order no doubt, but Summerfield in Benson, Vermont has all of these criteria and way more. The 100 acre parcel is mix of open pasture, hay fields, dells and woodland. There are two newer barns for hay and equipment storage. The land use lends itself to all manner of self sustainability in a community known for its participation in the #Vermont localvore movement. The residence has been ideally sited close to the center of the 100 acres which gives ideal exposure for alternative energy sources and affords great privacy while having expansive vistas in all directions. The three en suite bedrooms offer wonderful privacy with direct access to covered porches and the outside. The gourmet kitchen with it's granite counters, high end appliances and a great walkin pantry has direct access to the rear deck for informal dining. The three fireplaces offer great ambiance in two of the bedrooms and the expansive living room for entertaining. Summerfield offers all of the requested amenities but most importantly it reflects what we all come to #Vermont for, Quality of Life. Full details can be viewed in My Listings on this website and by MLS#4340325. Every once in a while it is good to step out of the box and look at what we see from the perspective of someone else. As a real estate broker, it's always interesting to get a clients reaction to an experience here in Vermont that is common to us who reside here but new to them. Conversely it is important and prudent for me to see Vermont through the eyes of a visitor. Such was the case this weekend when we traveled to Burlington to attend the Banff Mountain Film Festival, an annual event that is well worth the trip. As has been our custom, we head up Friday afternoon, get a room for the night, have an early dinner and attend the festival. This year I decided to try the newest of Burlington's hostelries, the Hotel Vermont. The Hotel Vermont is locally owned and opened for business in April 2013. 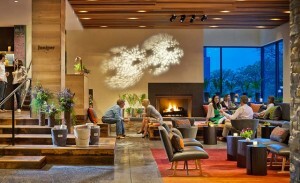 The theme is distinctly Vermont oriented from the construction, decor, amenities and the personnel. The basic premise could definitely be an easy setup for a cheese ball experience. Fortunately it has been pulled off exquisitely. After checking into our room with it's great view of #Lake Champlain, we headed the Hotels restaurant, Hen of the Wood. This proved to be one of the best dining experiences we have had in a very long time. Locally sourced farm to table ingredients combined into imaginative dishes that were delightful. Once again, #Vermont themed decor and an outstanding staff. The next morning, we chose to have breakfast at Juniper, the hotels bar/restaurant. Once again we were treated to an exceptional meal. I don't usually gush about such experiences, but I was greatly impressed by all that I saw of the Hotel Vermont. This is definitely a high recommendation for my clients visiting the Burlington area. Once they have experienced this, they will not want to leave. Can't help but boost business. And all you Vermonters, you owe it to yourself to reaffirm why Vermont is so special. One of the obvious offshoots of the current localvore movement in Vermont is that individuals wishing to participate in this wonderful trend need land. And not just any land. The land must be fertile, well drained with good exposure and orientation. No small measure for a state that has more than it's share of north facing slopes, shallow soils and wetlands. The vast majority of people contacting me about real estate are expressing a need for the property they buy to be able to support at least some agricultural activities including raising animals, growing crops, woodland management all within communities that are similarly engaged. To no small degree am I reminded of the Back to the Land Movement of the 1970's. For I was one of those who was looking to create a self reliant lifestyle by living off the land. In honesty, I had a dream but not much of a plan. Todays Back to the Land movement is an entirely different landscape. Todays farmers in Vermont have a framework of Sustainable Agriculture which has been developed and marketed to the envy of all other states. A fascinating study of how we got here and where we are now is well documented in "Greening Vermont, The Search for a Sustainable State" by Elizabeth Courtney and Eric Zencey. Many of Vermont's long abandoned farms are seeing renewed viability by the trend of speciality foods and products. Everything from grass fed beef, pork and lamb to artisan cheeses to natural fiber production. And through such interest, the Vermont hill farm is again a very desirable commodity not just for the beauty and serenity it offers but for it's ability to provide for itself and it's stewards. I recall a few years ago driving a buyer around who shortly after we got underway, exclaimed "What's going on with this seat?" He was from the south and wasn't familiar with heated seats. After I explained, at the time, what a great option it was, he said " So that's how you Vermonter's survive winter." Heated car seats are one of hundreds of ways that Vermonter's deal with the colder temperatures of winter. One of the best ways to stay warm is to turn to yet another localvore product, wool. 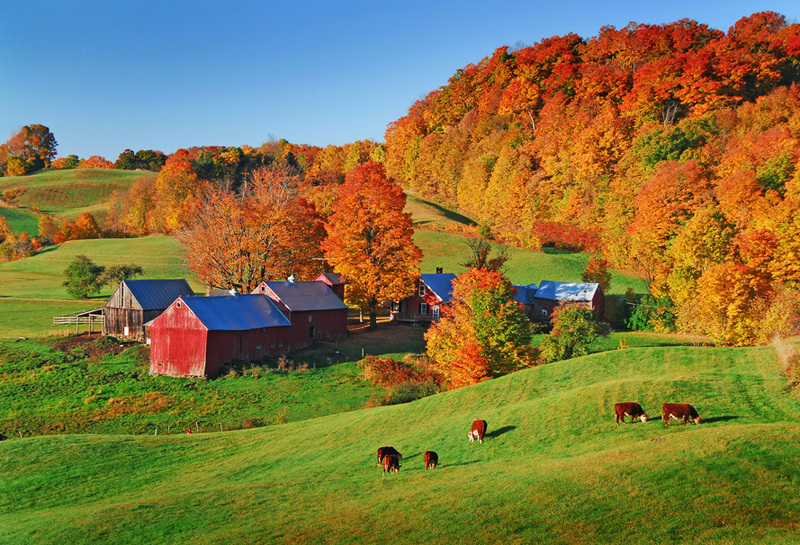 Most people associate dairy and cheese production with the agricultural heritage of Vermont. Yet, the biggest impact on Vermont environmentally and economically was the huge expansion of sheep farming after the Civil War. Eighty percent of Vermont's landscape was cleared to provide grazing and hay for the vast herds of sheep. Woolen Mills were built wherever there was ample water power available. Vermont's wool production provided clothing, blankets and outer wear for a large segment of the country. Vermont is once again recognized as being a leader in the production of wool and the manufacture of quality wool products. 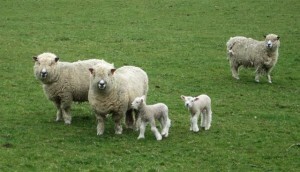 One of the oldest continuous makers of excellent wool products is Johnson Woolen Mills in Johnson, Vermont. Highly recognizable red checkered caps, jackets and even pants are the traditional hunter's garb. Their warmth and durability are the source of legend. Darn Tough socks in Northfield, Vermont are a favorite Vermont product. Available in many styles and weights, the socks fully live up to their name. So fully, that they come with a lifetime warranty that will replace any socks that wear out. One of the newest front runners of wool clothing is Ibex Outdoor Clothing. They have taken a proven raw product and have designed and manufactured some of the finest performing and stylish wool clothing to date. If you have the opportunity to be in Vermont this coming Friday 10/11 and Saturday 10/12, you owe yourself a treat by attending the Annual Ibex Tent Sale on the Green in Quechee, Vermont. This event has drawn devotees from all over the country for many years. Trying on an Ibex wool jacket on a crisp cool autumn day will make you wish for cold weather. Vermont is quite unique with it's seasons that are all so different and all so remarkable beautiful. Clearly my favorite in terms of inner reflection and stopping to appreciate all that surrounds us is Fall. The other morning I went out early to feed the horses and I had to put on my wool Ibex vest for the first time this season. The morning was crisp and that unmistakable cool clean air had a hint of the changes coming. The trees are ablaze in brilliant colors that can't help but deliver a sense of awe. There is an uncontrollable urge to completely embrace all that surrounds you and make it last forever. How best to enjoy this Fall season? I always like to go for drives along back roads that I haven't visited in some time. Truly, the fall colors are magnificent where ever you go. I always like to drop into country stores as I travel Vermont. A great many of the rural towns in Vermont still depend tremendously on the General Store. Many throughout the state also contain the local Post Office. You will be sure to encounter a strong aroma of coffee and hopefully home baked goods upon entering. I like to recommend to my customers and clients that are visiting this time of year to plan to be in a village that features a good General Store around lunch time. Sandwiches and drinks will be waiting. It's also a way to interact with local Vermonters and fellow visitors, all of whom depend on the General Store for their quick needs. A good source to locate General Stores in the Vermont Alliance of Independent Country Stores. Their website has many, but not all, General Stores in Vermont listed. As to what routes to take to view the foliage, it's really up to your individual wants. All of Vermont is very picturesque, and yet the foliage changes at different times of the season in different parts of the state. The best website to check is the Fall Foliage Report. There you will find what areas of the state and what roads are showing the most color. The only thing left to complete the fall picture, is a stop at a local farm stand for cider and donuts. It really doesn't get much better. For those of my readers that are flyfishers, the phrase "Match the Hatch" is easily recognized as our mantra for a successful outing. For those unfamiliar with the sport or the phrase, it is worth reviewing for it's close resemblance of a successful real estate search. Matching the Hatch is determining which artificial fly you use to match what insect is naturally hatching on the stream or pond that the fish are feeding on. Sounds simple, but the reality is, it can be very elusive. The fish can be very selective and never consistent in their choice of what they feel like eating. It can take many attempts with various flies of different sizes to break the code. Homebuyers can be just as befuddled as flyfishers as to why they aren't getting exactly what they want as they search for the property of their dreams. Working with a seasoned broker with a vast knowledge base and years of experience can help the cause dramatically. It's no secret that the predominant method of searching for a property is the internet. Simply plug in your search criteria and the search engines will select those properties that most closely make your choices. The price range, the acreage, the number of bedrooms are all there for you see. But it's the subtleties that can be the frustrations for a buyer. The almost intangible qualities of a property that search engines can not decipher. I recall once showing a gentleman several properties that met his criteria but were not hitting the mark. We retreated to my office and in the course of discussion he stated that as he was getting older, the need for an expansive environment was important to him. He felt that many properties were almost claustrophobic to him. The bell went off in my head and I took him to a brand new listing I had. It was only 3 acres, way less than he asked for, but the setting was at the top of a valley which created a very open expansive feel. He put it under contract immediately at the asking price of $1.6mil. A classic case of "Matching the Hatch" perfectly.